The Eleaf iStick 20W is a new box mod battery made by iSmoka with a fashionable metallic appearance. 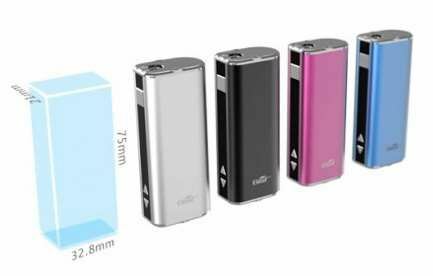 The Eleaf iStick 20W has a very compact size, you can hold the Eleaf iStick in the palm of your hand as shown in the pictures above. The Eleaf iStick 20W is very convenient and portable, but it also packs many amazing features such as 20 Watts capabilities with massive 2200mAh capacity and a beautiful OLED screen. The Eleaf iStick 20W can be had in 4 different colors: Black, Silver, Pinkish Red, Blue. The Eleaf iStick 20W has multiple protections such as atomizer short circuit protection, over 10 second protection and low voltage protection. Pairing the Eleaf iStick with the Aspire Nautilus Mini is a no brainer and will make an absolutely amazing setup capable of delivering the most amazing vaping experience. The Eleaf iStick is a tiny variable voltage/wattage mod which fires up to 20W and can be used in passthrough mode (you can use it while it's charging). This is the first device of it's kind, with a small form factor but still powerful enough to rival some of the larger more expensive devices on the market. The iStick feels great in your hand, is simple to use and works great with a range of tanks and clearomisers. In our opinion, putting a Aspire Nautilus or Kanger Aero Mega on this is as close to the perfect vape as you can get. Once you get this in your hands, you'll know why it's created such a buzz around the world and has been the talk of the vaping community for several weeks. Adjustable Voltage: Press the up-and-down arrow buttons to increase/decrease the working voltage between 3.3V to 5.5V. Note: Not to be fired at less than 1 ohm.